Berry the Fruit Fairy prepares for the Heart Day celebration in this sweet Candy Fairies confection. Berry the Fruit Fairy is distracted from her Heart Day duties when she sees a snazzy new dress on a fellow fairy. She’s supposed to be making candies for Princess Lolli’s celebration, but all she wants to do is make a new dress. She picks some wild candy hearts that she finds growing and tries to use those, but they turn out to be sour! Now, with the help of her friends, she must venture to the Sour Orchard to undo the yucky magic and try to set Heart Day right. What do you think?” Berry held up a string of colorful fruit chews. 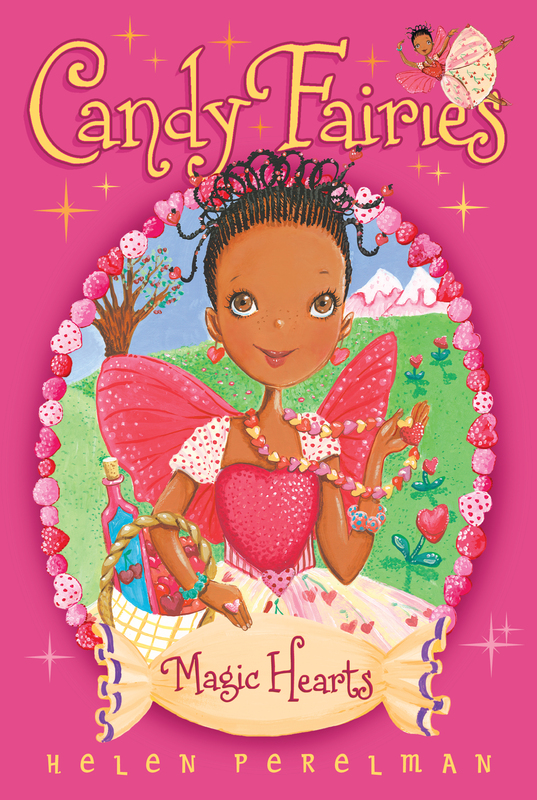 The Fruit Fairy enjoyed making delicious fruit candies, but she also loved making jewelry. The more sparkle the better! Berry loved anything and everything to do with fashion. “Berry,” Raina said. She had a worried look on her face. The Gummy Fairy was filling up a bottle of cherry syrup for the trees in Gummy Forest. She had come to Fruit Chew Meadow for flavoring for the red gumdrop trees—and to visit Berry. But instead of finding Berry working on her fruit candies, her friend was making a necklace! Berry shrugged. “These round fruit chews are just so pretty,” she said with a heavy sigh. She held up the colorful strand again and admired the rainbow pattern she had made. “I just had to make a necklace with them!” She carefully knotted the end of the string. Then she put on a special caramel clasp that Melli, her Caramel Fairy friend, had made for her. Berry placed the finished necklace around her neck. She proudly spread her pink wings as she showed off her newest creation. Princess Lolli was the ruling fairy princess of Candy Kingdom. She was a caring and gentle fairy, and always treated the fairies very well. All the fairies loved her and wanted to please her. The sweet princess’s favorite shape was a heart, so every fairy in the kingdom made special candy hearts from flavors found all over Sugar Valley. There were chocolate, gummy, mint, caramel, and fruit heart candies for Princess Lolli and the fairies to enjoy. Heart Day was a happy day, filled with good cheer—and delicious candy. “I will start on something today,” Berry declared. At that moment another Fruit Fairy flew up to the friends. Berry had just met her the other day. Her name was Fruli, and she was new to Sugar Valley. She had long blond hair, and today she was wearing the most beautiful dress Berry had ever seen. There were tiny purple and pink candies sewn along the collar and cuffs that sparkled in the sun. Over her dress was a soft cape made of pink-and-white cotton candy. The fairy soared down next to them with her pale pink wings. “Yes, I like to read,” she said very softly. She looked down at her white boots. Her response was so quiet that Berry and Raina could barely hear her. Again, her voice was so low and soft, Berry and Raina could barely hear her. “I just came to collect a couple of fruit chews for Princess Lolli,” Fruli said. “Well, you came to the right place,” Raina said, smiling. She gave Berry a little push forward. She wondered why her friend was being so quiet around this new fairy. Usually, Berry was very outgoing and not shy at all. “Berry grows the best fruit chews on this side of the Frosted Mountains.” She put her arm around her friend. “Raina,” Berry mumbled, feeling embarrassed. She smoothed her dress with her hands and noticed a big cherry syrup stain on the front. Oh no, Berry thought. What a big mess! Fruli has the nicest clothes. And look at me! “These chews?” Fruli asked, pointing. Fruli took a few candies and put them in a white chocolate weave bag. “Thank you,” she said. Before Berry or Raina could say a word, she flew off. “She was so shy!” Raina exclaimed. “Berry—,” Raina started to say. Berry flew off in a hurry, leaving Raina standing in Fruit Chew Meadow alone. Raina was worried. When Berry got an idea stuck in her head, sometimes things got a little sticky.